Does the Lake of Fire cleanse the “nations “? “It would seem that they are permanently excluded from God and the holy city. But we are surprised to read later on that the nations do in fact enter the city through the gates from the outside. Revelation 21:24-27. What has happened? The nations were in the lake of fire. What did they do to leave it? Having washed their robes in the lake of fire, the nations can now enter into the city through the ever-open gates (which they do) and approach the throne to receive their final healing as they eat from the leaves of the tree of life. Revelation 22:1-3. And it’s only now, after receiving their healing, that the story ends. 5 And night will be no more. They will need no light of lamp or sun, for the Lord God will be their light, and they will reign forever and ever. Sounds good? This is a typical prejudiced reading into something the passage does not say. It is also a major flaw in futuristic universalism teaching. Now I am not against universalism but against the way this author injects his idea of the cleansing nature of the Lake of Fire. He is not speaking about the nations which were thrown into the Lake of Fire. 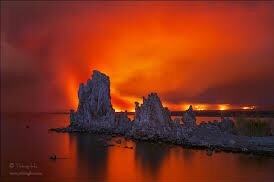 The Lake of Fire here has to do with the opening of the book of life. It says very clearly that if anyone’s name is not written in the book of life, he is thrown into the Lake of Fire for a second death. The book of life is mentioned once in Philippians in the New Testament. It is also predominantly mentioned in the book of Daniël. “At that time Michael, the great prince who protects your people, will arise. There will be a time of distress such as has not happened from the beginning of nations until then. But at that time your people—everyone whose name is found written in the book—will be delivered. Multitudes who sleep in the dust of the earth will awake: some to everlasting life, others to shame and everlasting contempt. Those who are wise will shine like the brightness of the heavens, and those who lead many to righteousness, like the stars for ever and ever. There are a few things we must note here. Firstly Michael is speaking to Daniël. The context of the word “people” here is the people of Daniël which are the Jews. Hence the names referred to in the book are Jewish and not Gentile. Secondly it mirrors that of Revelation 21. The second death there speaks about shame and everlasting contempt. It does not speak about being washed or cleansed. In fact this is what the book f Daniel says. The wicked are not cleansed. Now the book of Revelation in chapter 7 actually gives you a clue as to who are the names which are in that book. It is the 144,000 Jews from the 12 tribes. Also Daniel speaks about the abomination that causes the desolation as the time this would happen. Jesus spoke about this is Luke. You may say he did not use the words abomination. Well Luke is one of the 3 synoptic gospels. Here is how it appears in Matthew. “So when you see standing in the holy place ‘the abomination that causes desolation,’ spoken of through the prophet Daniel—let the reader understand— then let those who are in Judea flee to the mountains. You will see that it concludes with a warning to leave Jerusalem and a plea to flee to the mountains. More importantly Jesus’s words here mirror here of Daniël 12:1. Now what did we learn? 1. It’s about the Jews. Not the nations. Rather it is about the Jews which are in every nation. 2. Matthew 24, Daniel 12 and Revelation 21 are linked and are speaking about the same event. 3. Jesus spoke about it happening within his generation. Daniël spoke about a 3 1/2 year siege of Jerusalem. Revelation written in AD65 said it would happened “soon”. but the wicked will continue to be wicked. What is the Lake of Fire about? It’s simple. The prevailing passage which Jesus used to warn the Jews of this event is Matthew 24. A reading of Matthew 23 the passage leading into Matthew 23 will clearly show you. And so upon you will come all the righteous blood that has been shed on earth, from the blood of righteous Abel to the blood of Zechariah son of Berekiah, whom you murdered between the temple and the altar. Truly I tell you, all this will come on this generation. “Jerusalem, Jerusalem, you who kill the prophets and stone those sent to you, how often I have longed to gather your children together, as a hen gathers her chicks under her wings, and you were not willing. Look, your house is left to you desolate. 2. It’s about their generation. 3. The wicked here are those who remained in “your house” which was the temple. 4. The wicked were also those who refused to receive Jesus’ warning and mercy to leave Jerusalem. Hence it wasn’t God would judged them but their own hardened hearts. 5. The Lake of Fire was the destruction of the Temple and Jerusalem in AD70. Do not be lured into people painting fairy tales about how the Lake of Fire would cleanse the “nations”. What people do not understand is that the new Jerusalem is for the new man who is neither Jew or Gentile. That’s what the word “nations” mean. The new humanity was created through Jesus Christ. It is neither Jew nor Gentile, slave nor free, male nor female. It is not from Israel but many nations. These other sheep are the Gentiles. Since AD70, the old creation which was purely Jew is gone. The new creation which is from “all nations” has since taken place. Next What are doctrine of demons?